Kitchen Decorations: Super Speed Sam, Book 3 is a children's animal book for grades 3-6, written by Monty J. McClaine. It was a rainy afternoon, so no one could go out and play. Mom decided to make a cake, with Jack as her helper, and Molly and Sam as spectators. Everyone was pretty excited, especially Jack. He was so excited, in fact, that he rushed through the first step -- washing his hands. Mom decided to make the hand-washing process into a fun lesson before the cake; then it was time to get the flour. Just when it was finally getting interesting for Jack, and they were measuring out the flour and getting the eggs, the doorbell rang, and Mom went to answer it. Jack was so enthusiastic about the cake-making experience that he couldn’t help but get a bit inventive while he was waiting. He decided to toss the eggs up in the air and catch them with the bowl. The only problem was; he wasn't too good at getting them to land properly. Things went from bad to disastrous as Jack made a total mess of the kitchen while Molly cheered, and Sam wondered just how he'd clean up this mess in time. 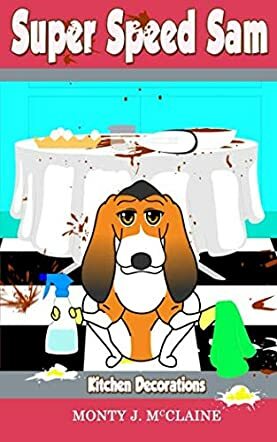 Monty J. McClaine's Kitchen Decorations: Super Speed Sam, Book 3 continues the adventures of the McClaine family including Super Speed Sam, their beloved basset hound who just happens to have super powers. Sam is sworn to protect his family when they get into trouble, especially six-year-old Jack, and watching how he goes into action and fixes things at dizzying speeds is hilarious. Every six-year-old should have Super Speed Sam on their side, and kids of all ages will be wishing the same as they read this fanciful and imaginative tale of a super-powered dog who makes everything turn out okay. I enjoyed reading Kitchen Decorations and couldn't help but sympathize with Jack after having to endure the hand-washing lesson before getting into the fun of baking. But the mess he made was so awful, I had to wonder if even Super Speed Sam could fix it. Kitchen Decorations: Super Speed Sam, Book 3 is an entertaining animal superhero fantasy for young readers and it's highly recommended.